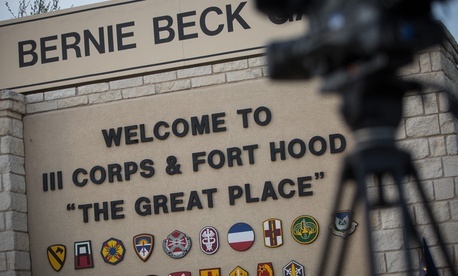 Another soldier-shooter has opened fired at Fort Hood, Texas, leaving four people dead -- three victims and the assailant, a soldier -- and injuring 16 others. “The shooter is dead from a self-inflicted gunshot wound,” said Lt. Gen. Mark Milley, Fort Hood’s commanding officer. Milley, speakng late Wednesday, said the deceased suspect walked into one building, opened fire, left that building and got into a vehicle, drove to another building, entered and opened fire again. There he was engaged by law enforcement, pulled out a .45-caliber pistol “and then he put the weapon to his head” and shot himself, Milley said. He would not identify the suspect’s name or rank until the suspect’s family was notified of his death. The suspect was being diagnosed for post-traumatic stress disorder but had not yet received a diagnosis. “We do know that this soldier has behavior health and mental health issues,” Milley said. The suspect was being treated for depression and anxiety and taking medications, he said. The suspect served four months in Iraq in 2011, and Milley said there are reports that he claimed to have sustained head trauma there but “he was not a wounded warrior.” Officials do not suspect terrorism as a motive, but said they are not ruling anything out as a deeper invesgtation into the shooter’s life just gets underway. Read more and check for updates on Defense One.